Hello everyone, Yvonne here sharing an elegant Thanksgiving card. The card is all about fall, using the typical seasonal colors of orange, yellow and brown. Perfect to send as an invite for Thanksgiving. Maybe for that special someone to let him or her know you’re thinking about them on this special day. Let me show you how to simply create the card. 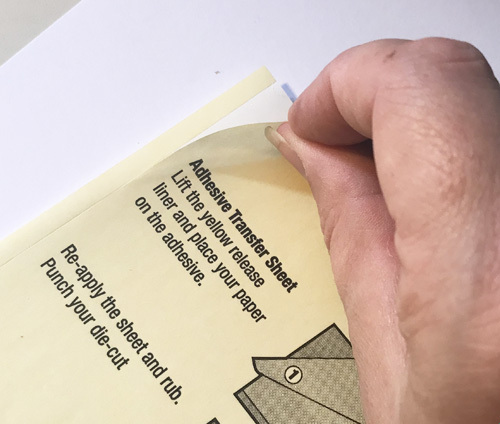 Trim a piece of patterned paper to a rectangle shape and alter the edges of the paper using a paper distressing tool. Adhere the panel to a kraft panel and then affix to a white card base, using the E-Z® Runner Refillable Dispenser. First, make the sticker die cut. Lift the yellow liner of a an Adhesive Sheet 4×6 inch and place a piece of dark brown cardstock on top of the adhesive surface. 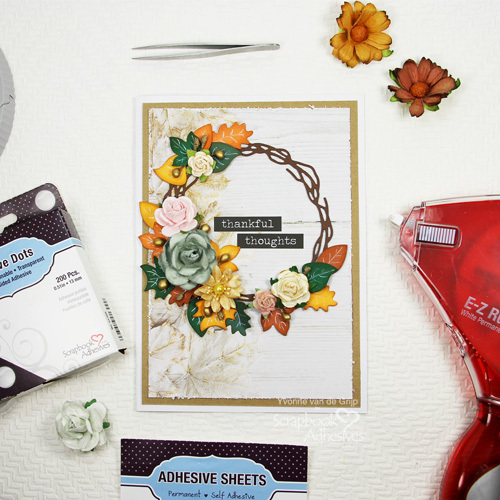 Trim the brown cardstock to the size of the wreath craft die you want to use. Then die-cut the brown cardstock, with the liner side down. Remove the liner to reveal the edge-to-edge adhesive and adhere the die cut onto the layered card panel. Next, die cut several leaves from green, orange and yellow cardstock. Use a silver pen to draw the veins on the leaves. Then ink the edges of the leaves with brown ink and an ink blending tool. Bend the leaves to make them look more realistic. Adhere the leaves and mulberry flowers to the card base using Adhesive Dots Large and Adhesive Dots Medium. Finish the flowers with stamens using the Dual Tip Glue Pen. Finally, adhere a sentiment sticker to your card and…voila…your Thanksgiving card is ready to give! This entry was posted in Adhesive Dots & Lines, Adhesive Sheets, Adhesives, Cards, Crafts & Tutorials, E-Z Runner® Grand, Embellishments, Fall, HomeHobby by 3L, Intermediate, Other Adhesives, Permanent Adhesive, Seasonal Craft Ideas, Skill Level and tagged Adhesive Dots Large, Adhesive Dots Medium, Adhesive Sheets 4x6", Card, Card Making, Die-Cutting, Dual Tip Glue Pen, E-Z Runner Grand Dispenser, E-Z Runner Grand Permanent Strips Refill, E-Z Runner Permanent Strips, E-Z Runner Permanent Strips Refill, E-Z Runner Permanent Strips Refillable, Fall, Thanksgiving, Tutorial, Yvonne van de Grijp. Bookmark the permalink.